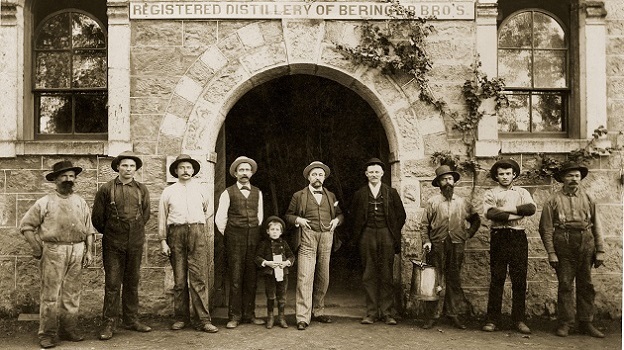 The historic Beringer winery was founded by the German-born brothers Jacob and Frederick Beringer in 1876, with Frederick opting to live in San Francisco while Jacob managed the vineyards and winery for 37 years from the historic Hudson House on the estate in St. Helena. This March, the Hudson House was the site of an extraordinary tasting of nearly four decades of Beringer Vineyard’s Cabernet Sauvignon Private Reserve, going back to its maiden vintage in 1977. The tasting provided a fascinating counterpoint to my other vertical tastings in March, which were classic studies of terroir, as they were essentially based on a single site. The Beringer Private Reserve, in contrast, is an unapologetic blend of vineyards assembled to make the best possible Napa Valley Cabernet from each vintage. While having multiple sources gives the winemaking team more flexibility, it has also made the Private Reserve something of a moving target—but also a fascinating tasting exercise. At the outset, the Private Reserve was made with grapes from the obsidian-rich Lemmon Ranch vineyard (later renamed Chabot), on the eastern side of the valley just north of St. Helena. (Beringer’s long-term lease on this vineyard continues today.) The vintages through 1980 were entirely from Lemmon-Chabot. Since 1981, however, the Private Reserve has been an increasingly complex blend of disparate components. Yet, while vintage character can vary depending on the main sources of fruit in a given year, quality has been remarkably consistent, chiefly because the Private Reserve program has benefited from continuity of winemaking. The Private Reserve Cabernet Sauvignon was dreamed up in 1977 by winemaker Myron Nightingale and then-assistant winemaker Ed Sbragia, who would go on to become one of Napa Valley’s great Cabernet masters. Laurie Hook joined Beringer in 1986 and eventually took over winemaking responsibilities in 2000 when Sbragia was elevated to Winemaster Emeritus. (Sbragia maintained a consulting relationship with Beringer through 2009.) In other words, just two personalities worked in harmony for nearly four decades. I should note that a couple weeks after my March tasting, Mark Beringer, a direct descendant of Jacob Beringer and previously the winemaker at Artesa Vineyards, was named Beringer’s new winemaker, with Hook taking on the role of Winemaker Emeritus. When Sbragia helped to create the Private Reserve back in ’77, his background was in Italian winemaking rather than in Bordeaux. For him, sanitary practices were paramount; he did not adopt such Bordeaux techniques as frequent racking, early blending of a wine’s components, and fining with egg whites. He also started harvesting at roughly 25.5 degrees Brix in 1978, which was high for the time. “Everyone else was picking food wines at 22,” he told me. The riper grapes, he added, brought fuller phenolic ripeness—more color, flavor and texture in the wines. “We picked with brown seeds; the grapes were just starting to soften up.” Sbragia did frequent pumpovers during the early days of the fermentation but eschewed rougher punchdowns. “And we ended up with resolved tannins,” he said. Total time on the skins was about 14 days, including just a few days of post-fermentation maceration. Sbragia added back the press wine after the fermentation, noting that “the wines were thus intact from the vineyard.” The components were racked into tanks, then allowed to settle until the end of the malolactic fermentation in late winter, at which point they were racked into barrel. He topped up the barrels monthly but did not rack again until the components of the wine were assembled a month prior to the bottling, which was normally 24 months later. The Private Reserve quickly became a blended wine, rather than a single-vineyard bottling. Beringer had leased and planted the State Lane vineyard in 1976 and began using this fruit in 1981. (In turn Lou Kapcsándy purchased State Lane in 2000 and replanted it in 2002; it has been the source of all of Kapcsándy Family Cellars’ outstanding wines since the outset.) Fruit from Beringer’s original St. Helena Home Vineyard (purchased by Jacob Beringer in 1875, the year before Beringer’s first harvest) also began to go into the blend in 1981. Then followed a growing procession of additional vineyard sources. With the 1986 vintage, Beringer began adding fruit from mountain vineyards, first Bancroft Ranch on rocky soil on Howell Mountain at an altitude of 1,800 feet, and in 1993 from Steinhauer Ranch on Howell Mountain (previously called Tre Colline and renamed after Beringer’s long-time vineyard manager Bob Steinhauer). Other new sources included Marston Ranch (Spring Mountain; beginning in 1997), Rancho del Oso (Howell Mountain; 1999) and Lampyridae (also referred to as “Firefly,” situated at 2,400 feet on Mt. Veeder; 2004). And beginning with vintage 1987, a bit of Cabernet Franc from Howell Mountain went into the blend. 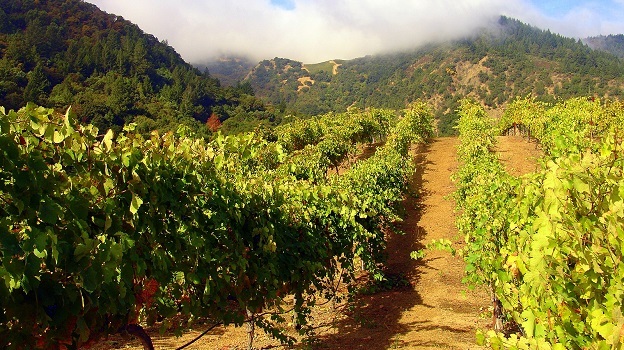 Meanwhile, other fruit sources were added through the years, including vines in Rutherford, Coombsville and St. Helena. While the blend has varied over the years, winemaking and élevage have not changed radically, although alcohol levels in the wines have risen moderately, especially as Beringer adopted drop irrigation and vertical shoot positioning beginning in the mid-1990s. Total acidity levels in the finished wines have decreased slightly and pHs have risen a bit since 2005. Over the years, under Laurie Hook’s direction, the extraction during vinification has evolved. Nowadays the wines are vinified in smaller tanks, a practice that allows for greater precision of harvesting, but also requires constant tasting during fermentation. Hook prefers barrels made by Séguin-Moreau, Taransaud and Damy. Normally the wine is aged in all new barrels but that percentage can drop to 95% or 90% in some vintages. Hook makes greater use of pre-fermentation cold soak than Sbragia did and uses some extended maceration for certain lots. Today she typically racks the wines three or four times in total. She filters prior to bottling but does minimal fining. In recent years the wines have gone into barrel a bit earlier and remain there for less than two years. So bottling today is more likely to be two years after the harvest than 28 to 29 months later. Not surprisingly, annual case production has been quite variable through the years, ranging from as little as 1,091 in 2011 to 24,125 in 1997. In most recent years, annual production of the Private Reserve has ranged between 5,000 and 12,000 cases. Clearly, the consistency in quality through the years has been made possible by Beringer’s ability to blend from multiple top-quality vineyard sites across Napa Valley, from the valley floor to the mountains. Harvest conditions can vary widely between vineyards, and of course the blend can be radically adjusted from year to year depending on which vineyards did best. According to Sbragia, in cold years he could use a high percentage of valley fruit when the mountain fruit was too herbaceous while in hot years he could emphasize high-altitude grapes because they retained healthier acidity and more minerality. Laurie Hook’s approach to the Private Reserve was virtually the same as Sbragia’s was. “Our goal has always been to make the best wine we could, to capture the essence of each vintage. We never looked for a house style.” She went on: “The Private Reserve was not necessarily meant to be immediately approachable but has always been made to be ageworthy.” Indeed, this recent vertical tasting suggested that the better vintages of this wine can be expected to enjoy a long life in bottle—easily 20 to 25 years, and sometimes longer. Some of the earliest vintages (i.e., those from the late ’70s and early ‘80s) are past their peaks but, at 30+ years of age, still make for pleasant drinking.